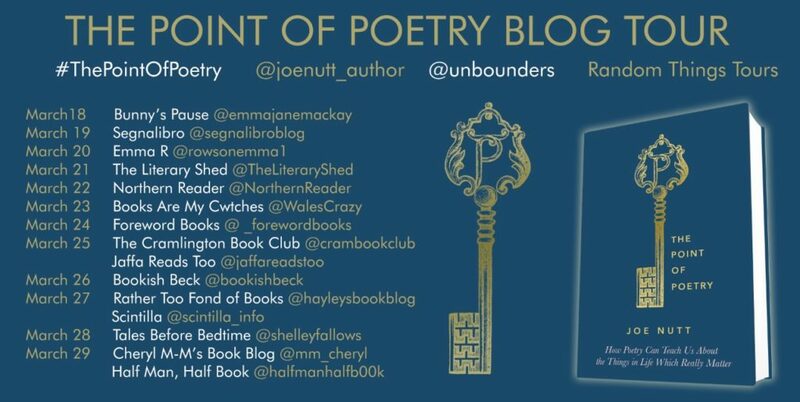 Welcome to Halfman, Halfbook for my stop on the Blog Tour for The Point of Poetry by Joe Nutt and published by Unbound. What’s the point of poetry? It’s a question asked in classrooms all over the world, but it rarely receives a satisfactory answer. Which is why so many people, who read all kinds of books, never read poetry after leaving school. Exploring twenty-two works from poets as varied as William Blake, Seamus Heaney, Rita Dove and Hollie McNish, this book makes the case for what poetry has to offer us, what it can tell us about the things that matter in life. Each poem is discussed with humour and refreshing clarity, using a mixture of anecdote and literary criticism that has been honed over a lifetime of teaching. Poetry can enrich our lives, if we’ll let it. The Point of Poetry is the perfect companion for anyone looking to discover how. If you’d have asked me what’s the point of poetry at the age of sixteen you would have got a very different answer than I would give now. My English teach of the time had managed to almost put the entire class off reading and it would be a very long time before I even though about picking up a book of poems. In the end, I came back to poetry a couple of decades later via a circuitous route. Some of my favourite books on the natural world have been by authors who are best known as poets, such as Kathleen Jamie and Paul Farley, and it was the desire to read more by them led me to pick up their poetry books. From those small re-beginnings, I have made a conscious effort to read at least one poetry book a month now. 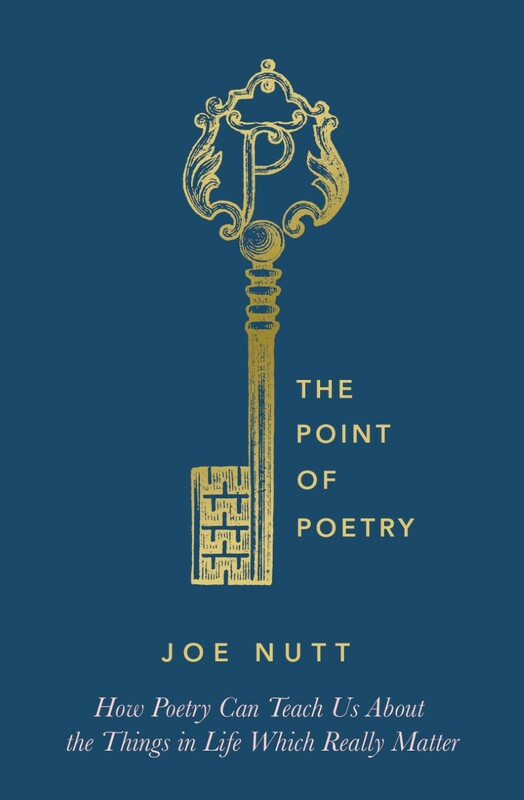 Joe Nutt is well placed to reignite a love for poetry in other people, as his love for it has been honed over a lifetime of teaching it to others. In this book, he considers twenty-two poems, taking a chapter to concentrate on a specific poem. There are some really famous ones in here, such as The Tyger by William Blake and Adlestrop by Edward Thomas as well others that are less well known, such as The Gun by Vicki Feaver. So I had heard of, but most of them I hadn’t come across before at all, nor read. He takes each poem and breaks it down into manageable sections before analysing those parts and drawing out exactly what the poet was trying to do. Thankfully he doesn’t go into endless detail, but his pointers will help you get the maximum out of the poem. 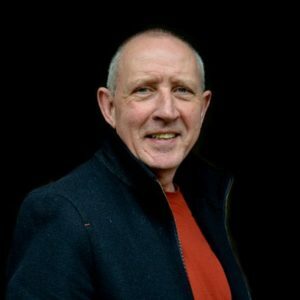 Each of the poems he has selected build towards the final two that he considers the two best written in the English language, The Prelude by William Wordsworth and Paradise Lost by John Milton. With these, he encourages you to use the techniques for gaining deeper meaning that he explained throughout the book with the other poems and get you to apply them to these. I liked having the single chapter per poem, it works well and you can dip in as you want. It is good to have poems that he loved in there as well as ones that he was not so keen on. Poets have a way of cramming so much meaning into so few words and overall I thought this was worth reading, to have someone explain just what the poet had in mind as they pulled the words onto the page. My thanks to Anne Cater from Random Things through my Letterbox for arranging this and to Unbound for a copy of the book to read.